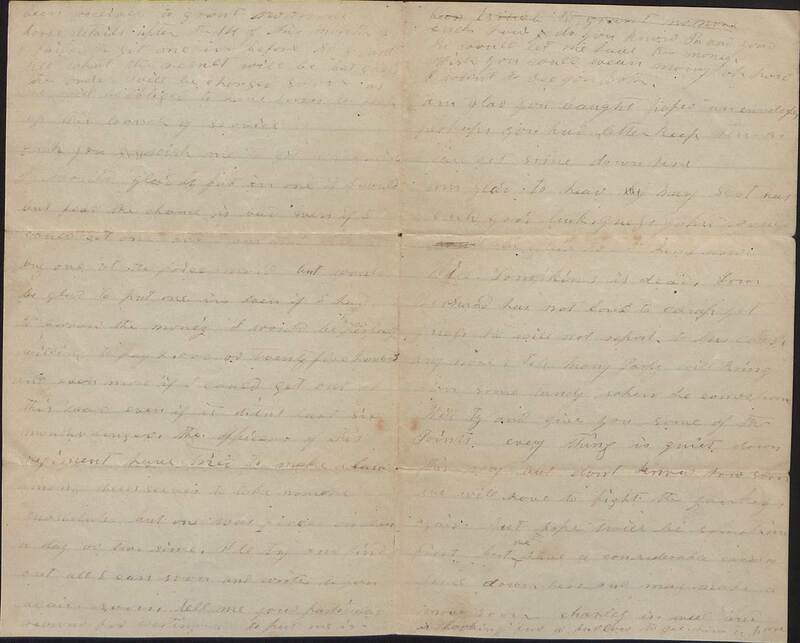 Item Description: Letter, 17 May 1863, Robert W. Parker to to his wife, Rebecca Louise Fitzhugh Walker Parker, about possibly finding a substitute for him in the war. Parker served in the 2nd Virginia Cavalry of the Confederate States of America Army from the onset of the American Civil War, and attained the rank of 4th Sergeant. Robert was killed in action at Appomattox Courthouse, Va., on the morning of 9 April 1865, the same day that Robert E. Lee surrendered his Army of Northern Virginia to the Union Army. Item Citation: From the Robert W. Parker Papers #5261, Southern Historical Collection, The Wilson Library, University of North Carolina at Chapel Hill. Your kind favor of the 30th Apr came to hand this evening after laying over so long in the Culpeper mail, which we didn’t get till this evening. Sincerely wish I could have gotten it sooner, but we have been moving about so much we have hardly part of the time had the chance to read them, had we received them. This note is the first I have received from you since we left this evening through Alick Pollard, and that you both were on foot. Was greatly disappointed at not receiving a note from you, but have to look over such things. I am sorry to inform you that my hopes of getting home soon are somewhat blended, as orders have been received to grant no more horse details after the 14 of this month, and I failed to get on in before, so I can’t tell what the result will be, but guess the order will be changed soon, as we will be obliged to have horses to keep up this branch of service. Duck, you wish me to get a substitute. I would gladly put in one if I could, but fear the chance is bad even if I could get one, and I am not able to buy one at the prices now, but would be glad to put one in even if I had to borrow the money. I would be perfectly willing to pay 2,000, twenty-five hundred and even more if I could get out of this war, even if it didn’t last six months longer. The officers of this regiment have tried to make a law among themselves to take no more substitutes, but one was fired on them a day or two since. I’ll try and find out all I can soon and write to you again soon. Tell me your particular reason for writing me to put one in. Duck, how do you know Pa and your pa would let me have the money? Wish you could wean Mory. Oh, how I want to see you both. Am glad you bought paper and envelopes. Perhaps you had better keep them, as I can get some down here. Am glad to hear Mary Scot has such good luck; guess John would be glad to get home now. Will Tompkins is dead. Tom Bernard has not been to camp yet. Guess he will not report to this camp anymore. Tell Mory Parpy will bring him some candy when he comes home. Will try and give you some of the points. Everything is quite down this way, but don’t know how soon we will have to fight the Yankees again, but hope ’twill be sometime first, but we have a considerable cavalry ford down here and may make a move soon. Charley is well and is looking for a furlough to get him a horse. Direct your letters to Culpeper CH. Sorry to hear Ben Hilton made his escape. Hope they will catch him. Duck, my horse is nearly played out, and if they don’t give me a detail I hardly know what to do. Waddie Burton wants me to send for a horse, but don’t think I shall do so. If I can’t have the priveledges of other men, I’ll stay in rank a while longer with Nelly. Duck, please don’t delay writing to me. I am always anxious to hear from you. My love to you and Mory and all friends. 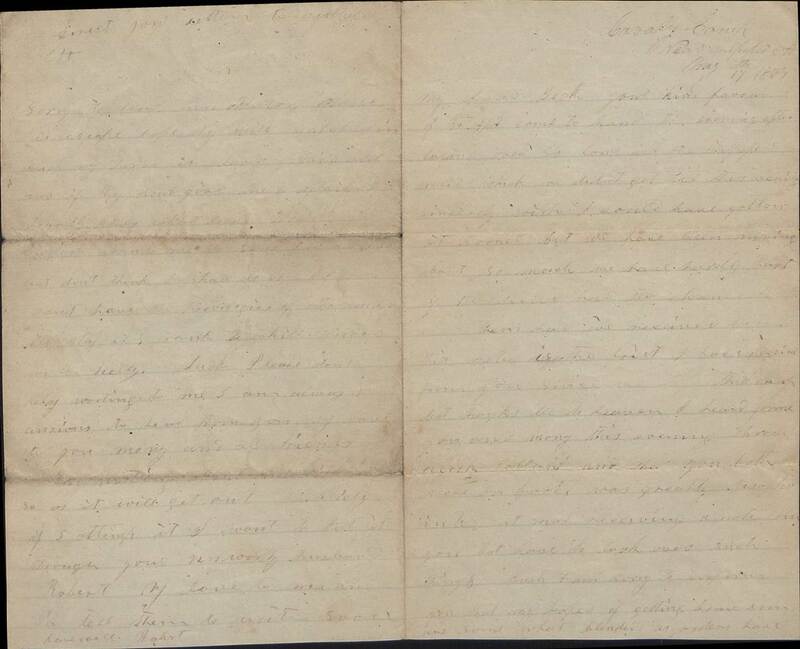 This entry was posted in Southern Historical Collection and tagged 2nd Virginia Cavalry, Confederate States of America, Rebecca Louise Fitzhugh Walker Parker, Robert Parker, Virginia. Bookmark the permalink.